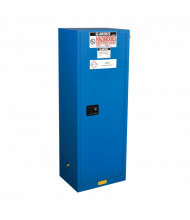 Top-Selling Safety Cabinets on Sale! 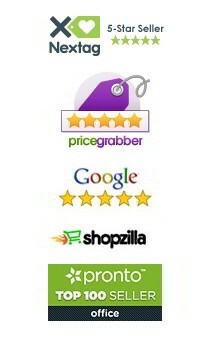 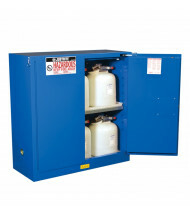 Comply with Federal & State Regulations. 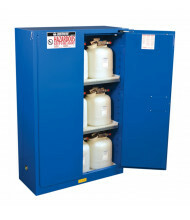 High-Quality Safety Cabinets for a Variety of Applications. 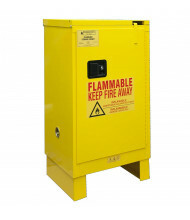 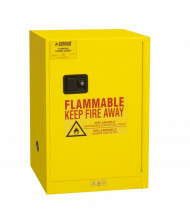 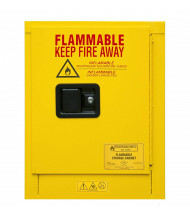 Flammable Safety Cabinets: Engineered to safely store flammable liquids and chemicals like diesel and gasoline. 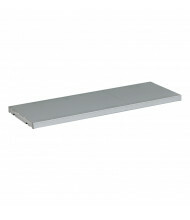 Configurations like slim, undercounter, and countertop handle a variety of storage considerations. 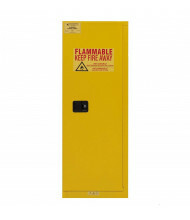 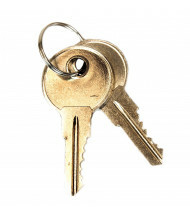 Manual and self-closing door options available. 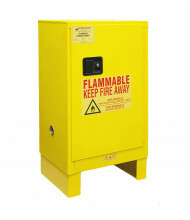 Combustible Safety Cabinets: Stores combustible liquids such as solvents, paints, and inks in a responsible manner. 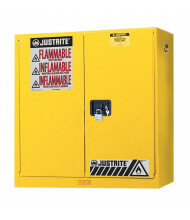 Decreases potential fire risks with features like insulating air space and flame arresters. 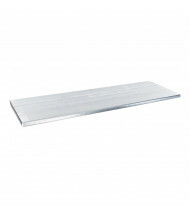 Bi-fold and hinge door models available to suit different workspace needs. 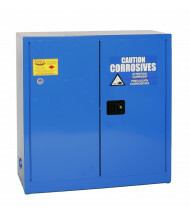 Acid & Corrosive Safety Cabinets: Storage for acids and corrosives needs special attention to ensure long-lasting use. 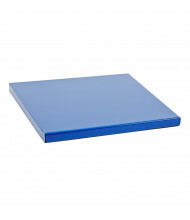 Designed with wear resistant details like seam-free surfaces and baked-on powder-coat finishes. 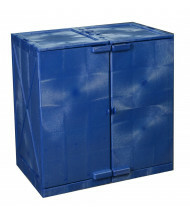 Optional features include ChemCor thermoplastic lining to protect against corrosion. 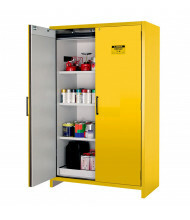 Hazardous Waste Safety Cabinets: Safely store hazardous chemical materials to reduce potential harm in the work environment. 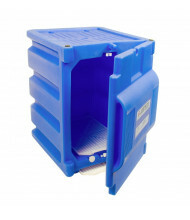 Base options include box legs that allow moving by forklift and lagging to the floor. 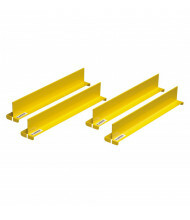 Available in yellow, blue, and white finishes. 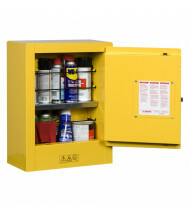 Pesticide Safety Cabinets: Decrease unnecessary exposure to pesticides and insecticides by storing in a safety cabinet. 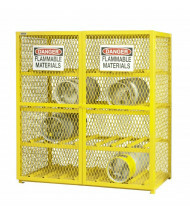 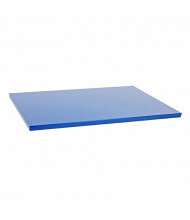 Features include dual flame arresting vents and corrosion-resistant polyethylene trays. 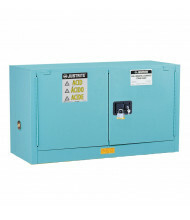 Painted green for quick content identification. 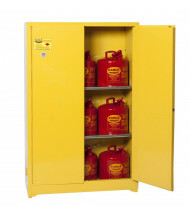 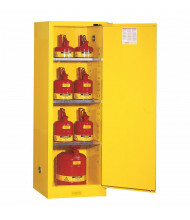 Drum & Gas Cylinder Safety Cabinets: Stores drums and gas cylinders for added safety and danger prevention. 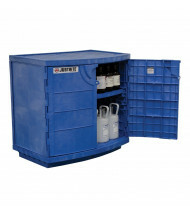 Configurations include vertical and horizontal cylinder storage. 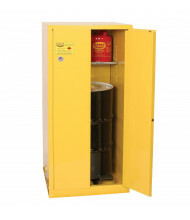 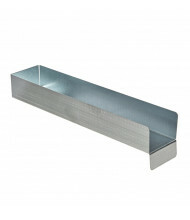 Features durable steel construction and adjustable shelves. 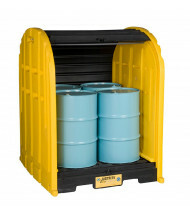 Storage capacity ranges from a single drum up to 20 cylinders. 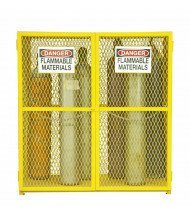 Safety Cabinet Accessories: Maintain and improve the abilities of your safety cabinet with accessories like pass-through valves, riser leg frames, and replacement security bars. 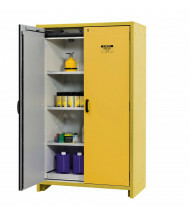 Adjustable shelves provide added storage options. 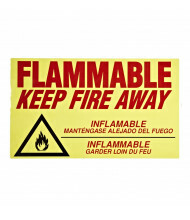 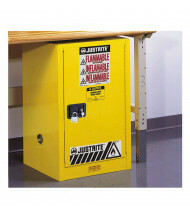 A variety of warning labels increase cabinet visibility and safety.